Today I was privileged to be shown around Durban by two of the experts in Kniphofia, Dr Syd Ramdhani and Prof. Himansu Baijnath. Although not the most floriferous day on the trip, it was one of the more enlightening ones because apart from seeing the pokers in the field, I was able to talk about poker biology and evolution. In particular, we visited the site of the racecourse lily, Kniphofia pauciflora, probably the rarest Kniphofia. Kniphofia pauciflora grows in the middle of the Clairwood Racecourse, a patch of rough ground not more than a few square metres. 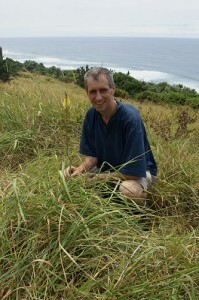 There are possible less than 20 plants surviving in the wild, although it has been distributed widely in cultivation. 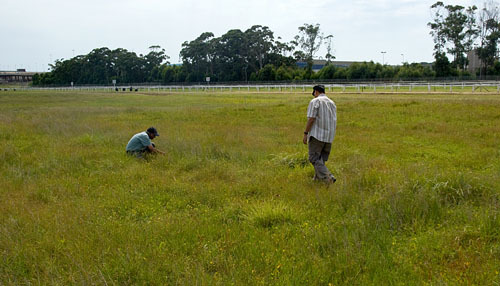 The plant was not flowering but to see its last wild refuge, a small plot in the middle of a racecourse that is possibly to be sold for development, was a great reminder of the fragility of many species. We went on to see a population of Kniphofia gracilis, which grows right by the coast in the grassland just above the shore. “Gracilis” is an abused epithet by past horticulturalists for small hybrids, not necessarily having anything to do with genuine Kniphofia gracilis. This was evident from the plants we found, which were around 1m tall, not dwarf like the cultivars described as Kniphofia gracilis hybrids. We made an unsuccessful attempt to find Kniphofia littoralis, and the coastal forms of Kniphofia linearifolia and Kniphofia laxiflora that we found, were not in flower. Nevertheless it was good to see that Kniphofia grow in tropical coastal grasslands – not where I had imagined their prime habitat. 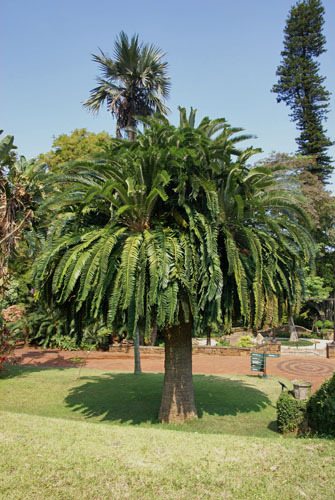 Plant of the Day – Encephalartos woodii. A solitary plant of this species was found by John Medley Wood at Ngoye Forest and planted in the Durban Botanic Garden in 1895. Unfortunately, it was only a male specimen, no female has ever been found. Therefore, all plants of this species in the world originate as offsets from this one tree. 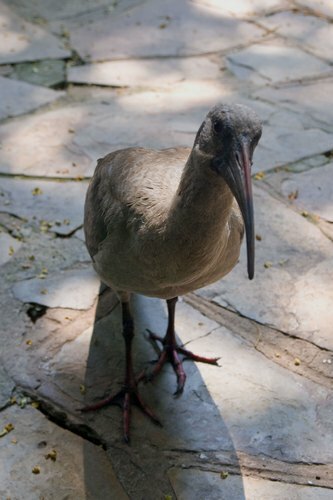 Poker of the Day – Hadeda ibis. This bird is most well known for its call from which it derives its name: ha-de-da. It is also a welcome visitor to gardens for its propensity to aerate your lawns free of charge with its long curving bill poking into the ground in search of grubs. This one was a friendly visitor to the Durban Botanic Garden café – it certainly made a change to sparrows picking up the crumbs. Clairwood, Durban Botanic Garden, Kniphofia. Bookmark.